We get the unique opportunity to put the Tesla Model S 100D through its paces across Europe! My first introduction to the Tesla brand was nearly ten years ago when I was working on a popular show called Toys 4 Big Boys in Dublin’s RDS. Although the day job was still publishing car magazines we were often called upon to help organise unique cars for various events around Ireland. It is at this point we came to learn more about Tesla and subsequently landed a deal to showcase the first Tesla Roadster in Ireland, long before the company had any Irish presence. The car, which was loosely based on a Lotus Elise, stole headlines around the country and indeed shortly after, an Irish gentleman in Cork took delivery of Ireland’s very first Tesla. 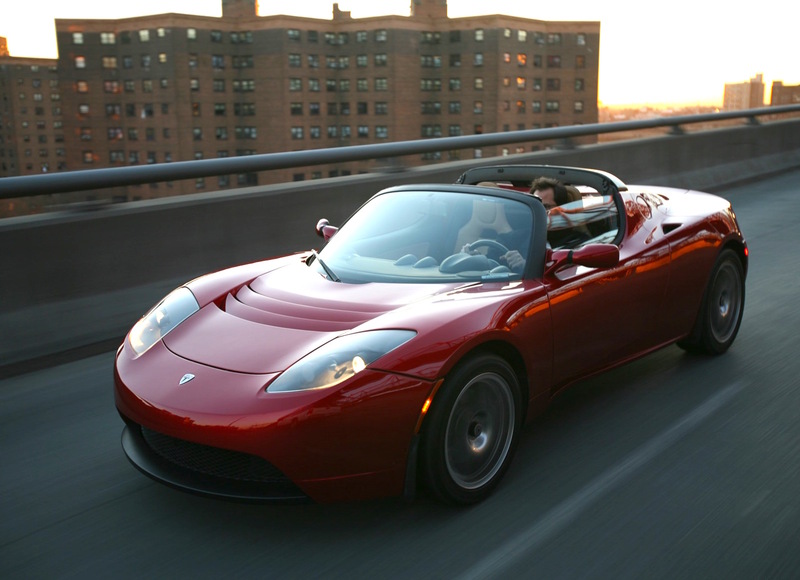 Ironically at the time of writing, the first Tesla Roadster is back in the headlines once again after becoming the first car ever launched into orbit! The Tesla story is simply staggering and it has evolved at a phenomenal pace to what it is today. The company was formed back in 2003 but in the last decade it has gone from becoming the brainchild of PayPal creator Elon Musk into one of the largest players in cutting edge zero-emission automobiles. After much testing and development the Roadster project ended only to make way for Tesla’s first bespoke creation called the Model S. This good-looking creation features a monocoque structure made from aluminium with steel used only to add strength in key areas such as the crumple zones. 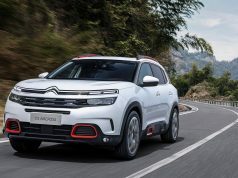 Buyers here in Ireland have a choice of three battery options starting with the 75D, which has a range of 490km, followed by the 100D with 632km and the range topping P100D that does 613km. In all cars, the battery pack sits just under the cabin floor surrounded by a sub frame for not just safety, but also torsional rigidity. Prices for the 75D start off at a shade over €91,000 and rise steadily depending on the optional extras. Our recent test car was to be the €111,500 Model S 100D although with a number of optional extras, the price quickly climbs to €139,178. 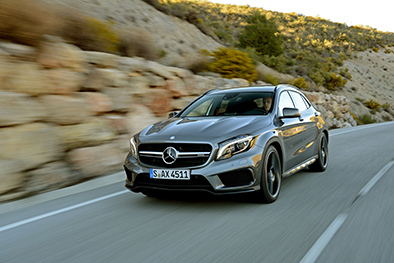 At this price point we are firmly into sports saloon territory where the likes of BMW, Porsche and Mercedes-Benz thrive. 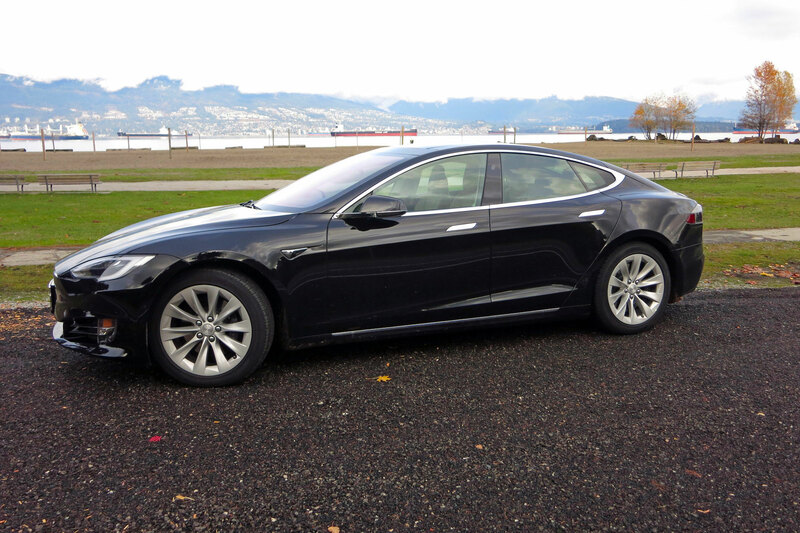 Can the Model S really mix it with the giants in this sector? 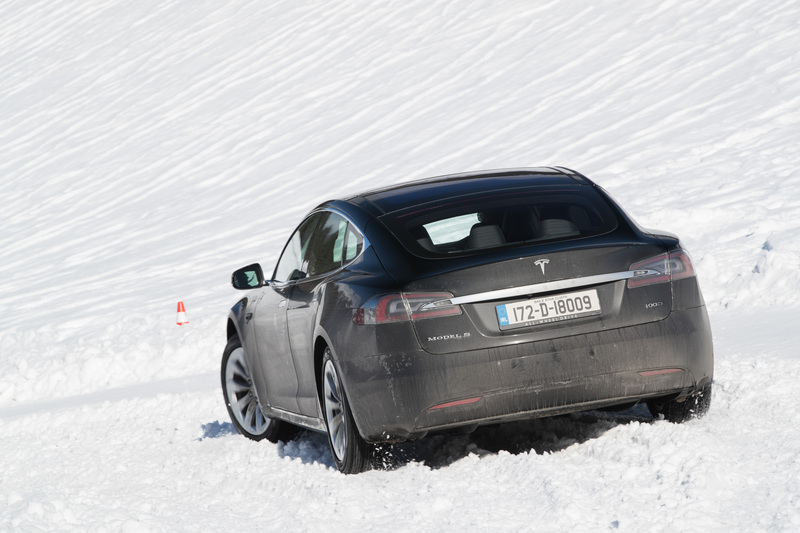 To find out we were entrusted with the task of driving the 100D from Dublin to Austria in a unique trip to see how the car would handle range, severe temperature drops and even some snow driving. After collection our first task was to admire the surroundings in which we would spend so much time. 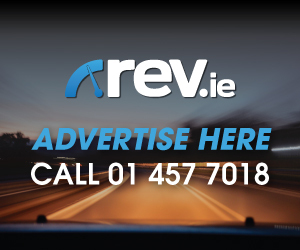 Our car had the Premium Black interior priced at €3500 with a stunning €250 Carbon Fibre dash surround. All Model S cars now have a panoramic roof, which lets in much more light. 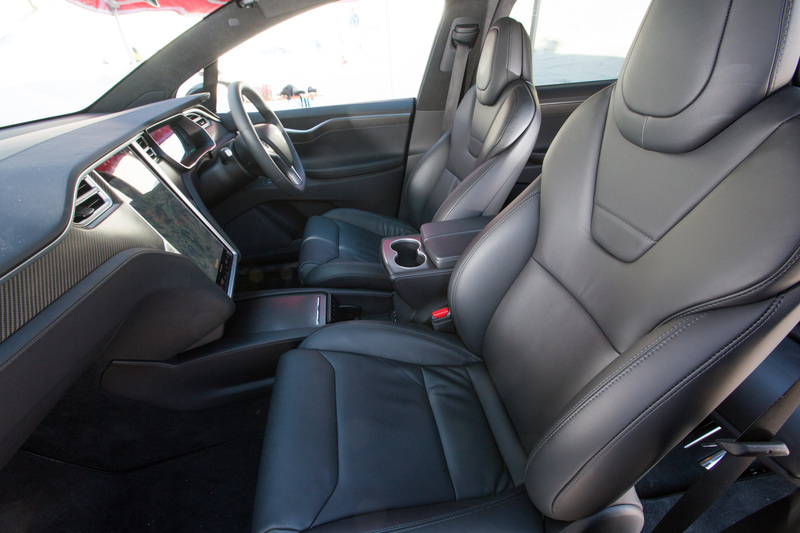 As always the main focal point of any Tesla interior is the 17-inch touchscreen infotainment system. It’s rather Apple like in its workings meaning it’s incredibly easy to get used to. 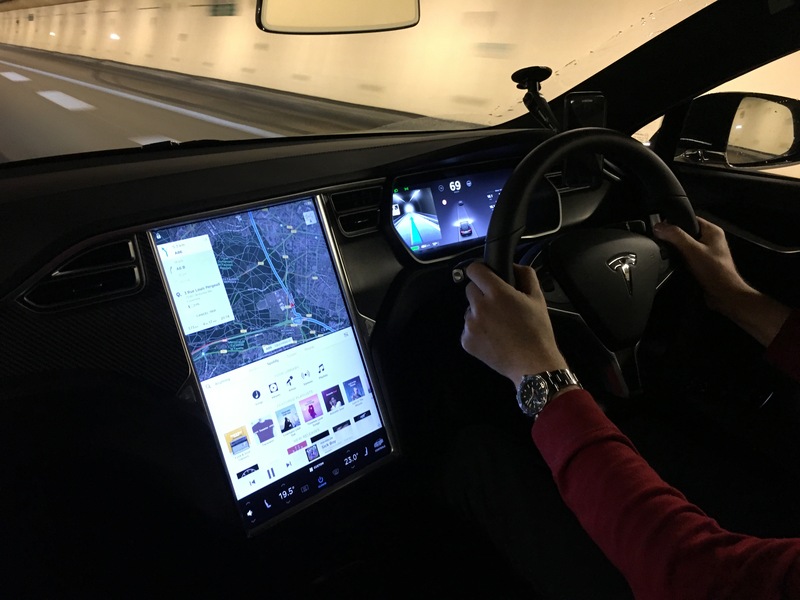 Google maps provides the familiar Navigation only this has further intelligence from Tesla to allow you accurately calculate routes with chargers highlighted at suggested stopping points with real time traffic. 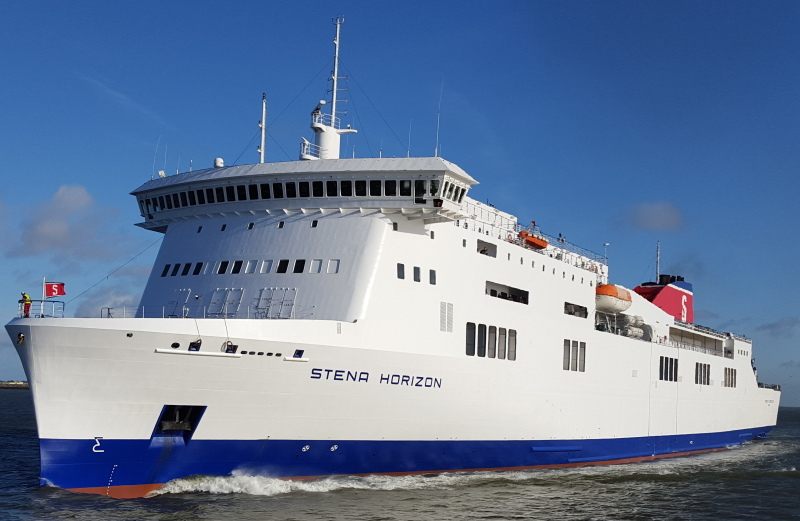 Speaking of routes our first destination would be Rosslare to catch the 16:30 Stena Horizon to Cherbourg. With two small overnight cases loaded we set off in miserable wet conditions with 475 kilometres of range in the tank. We made good time getting to Rosslare and with 30 minutes to kill before check in, we opted for a coffee break in the local Drinagh based Topaz garage. This stop also allowed us to avail of a quick charge from the ESB point, which the Tesla can use with an additional adapter to take the 44kWh charger. Once the light went green we could track the charge progress on the Tesla App with a coffee in hand. This wasn’t a necessary stop with 280km in reserve but if the ferry couldn’t provide us with power, we thought it best to take a charge, which subsequently proved to be the right choice. At the point of parking the Model S on the ferry we had 370km range and although the staff did try obtain us power from a regular 13-amp supply, it wasn’t to be due to the cars location amongst the trucks on the freight deck. We retired to our cabin for a good nights sleep on what was a remarkably smooth sailing for this time of the year. 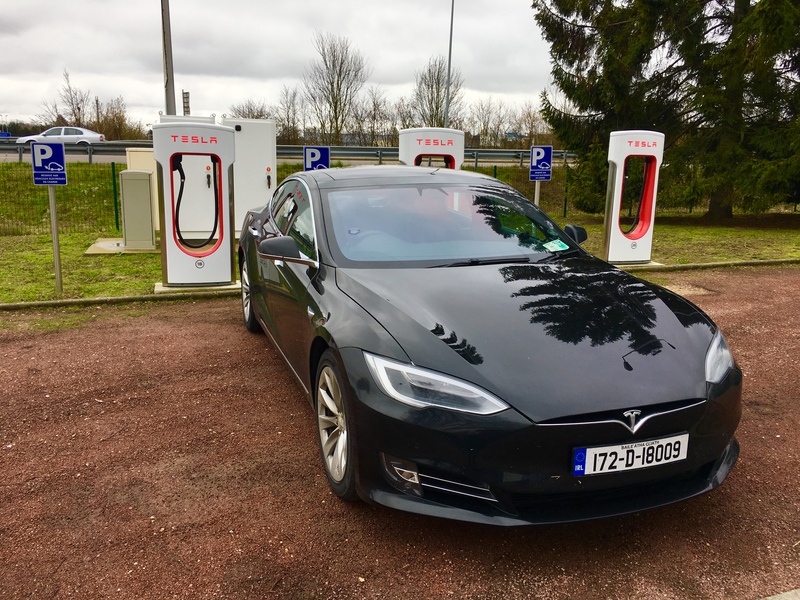 Ireland so far has just three Tesla Supercharger points, which allow the car to take up to 120kWh but on our departure from Cherbourg it was time to enjoy the Tesla for what it really is. Our Google maps were littered with regular charge points but more importantly the red Superchargers are highlighted on your route meaning range anxiety is simply a thing of the past. Getting out onto the motorway and sinking the go pedal is just exhilarating as the 100D sprints to 100km/h in just 3.8 seconds and is capable of 250 km/h. 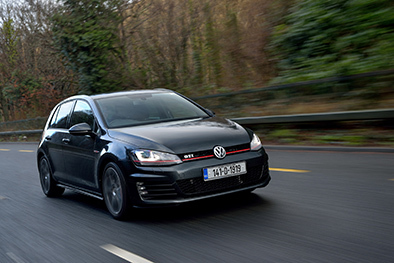 The surge of power is what gets me every time and with 660Nm of torque on tap, there is very little from your regular combustion engine powered rivals that will keep with you. The power is put down through dual electric motors, one on each axle and by balancing torque to each wheel it adjusts the amount of power over 100 times per second depending on the grip levels. The ride is pretty phenomenal also thanks to the now standard Smart Air Suspension. 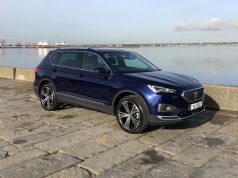 The car height can be adjusted up or down depending on terrain but it felt incredibly smooth mile munching on motorways and even on the twisty B roads, the car simply doesn’t feel the two tonne weight that it is! Our first stop a little more than an hour in was more out of necessity to use the facilities but we also decided to avail of our first Supercharger and pulled in with 210km range. A 30 minute coffee stop gave us an additional 200km and we were off for another two hours where we would stop on the outskirts of Paris for lunch. This 60-minute break as suggested by the Tesla’s on board computer gave us over 500km of range but sadly little by way of choices to eat. Some of the Supercharger points don’t have great amenities nearby so it is something to bear in mind. After this it was a four-hour stint to get down to our accommodation in Haute Saóne on the Eastern side of France. Again we probably had the range to make it but with nature calling we opted for one final 15-minute stop and availed of another quick charge. 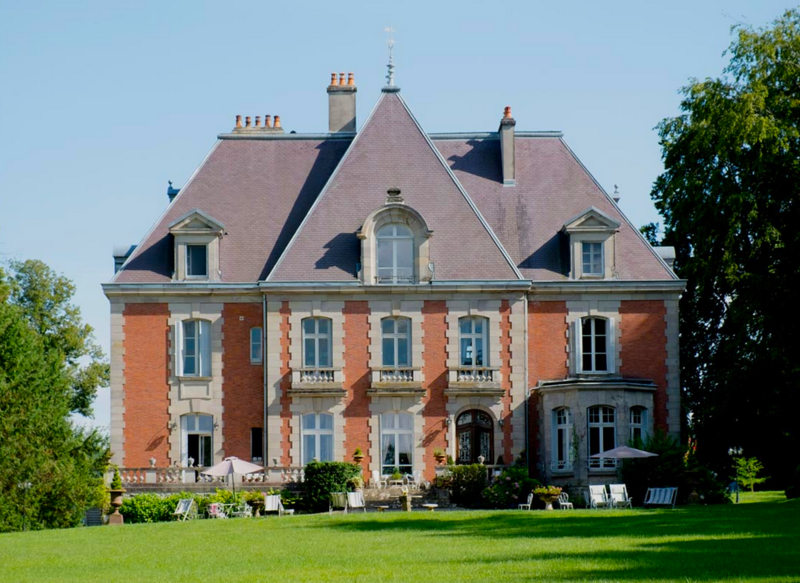 Our accommodation for this night was the Château de la Presle, which is run by the extremely friendly and talented chef Marie-France. We enjoyed the assault on our senses from the exquisite Louis XIII style decor to the fine dining that we were lucky enough to experience. 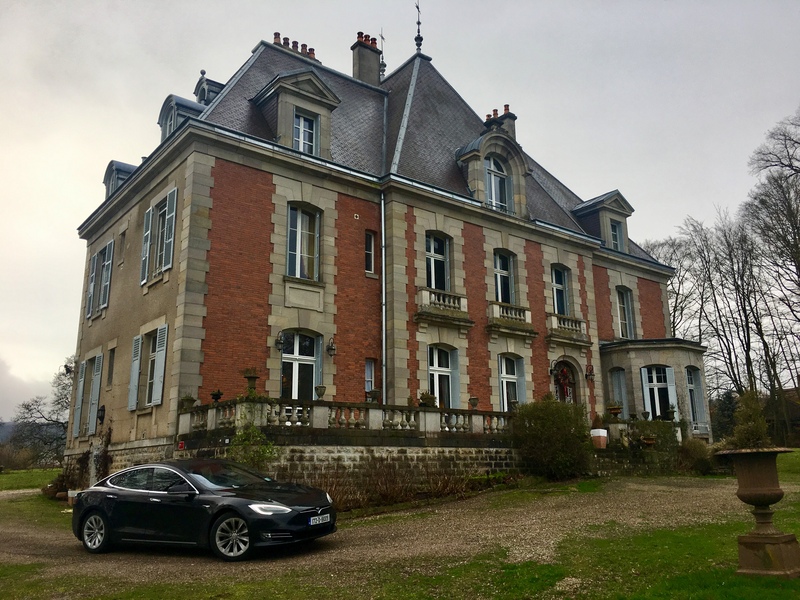 What made it the perfect stay is that the proprietors are Tesla Model S owners and they run the château as a Destination Tesla charge point. This allowed us to fully charge throughout the night ready for another marathon stint. When dawn broke, both the Tesla and our bodies were charged and ready to break for the Switzerland border. Four hours in we stopped just outside Zurich to have lunch and take our one and only charge for the day. The car clearly told us our afternoon stint would take us through Liechtenstein and across the Austrian border where we would climb to scenic Innsbruck with range to spare. What it didn’t tell us was that conditions would change and the temperatures would drop off significantly with some lying snow and ice. 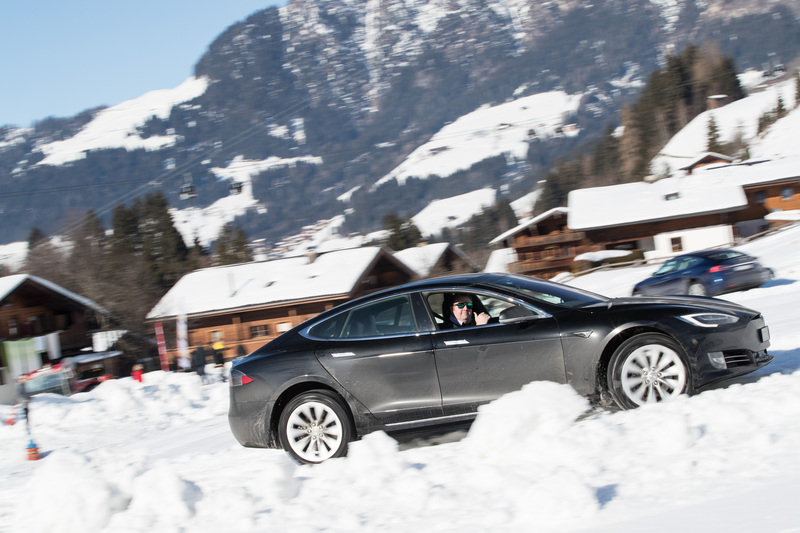 Thankfully neither seemed to trouble the Model S because it was fitted with all weather tyres and the previously mentioned incredibly sophisticated all wheel drive system. What battery life we did loose due to the temperature drop we easily got back in regenerative braking. It was another long stint for both of us but we got to Austria as nightfall descended in time for some Tesla celebrations. 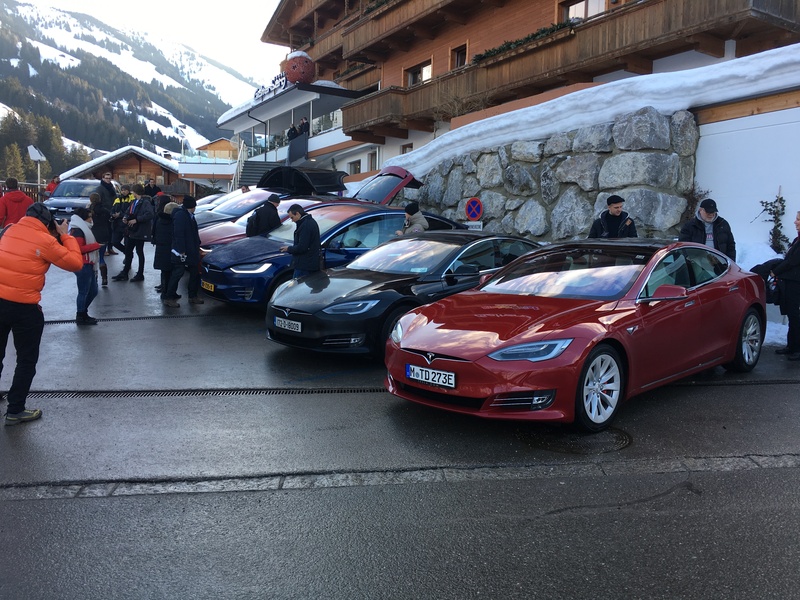 Several other Model S drivers had made the trek from various parts of Europe but few had covered over 1500 kilometres. The following day we got to put our car through its paces in the snow before heading to Munich to fly home to Dublin with our mission complete. Our job on this trip was essentially to do away with the term “Range Anxiety” and I think we can safely say that Tesla does this with all of its models and not just the 100D. We took on the challenge to drive the car on a demanding road trip, and at no point were we worried about not making it to our next destination. The car was driven in the same fashion we would drive any normal combustion engine powered car. Is it the perfect car? I’m not sure but it’s certainly the best electric car on the market. 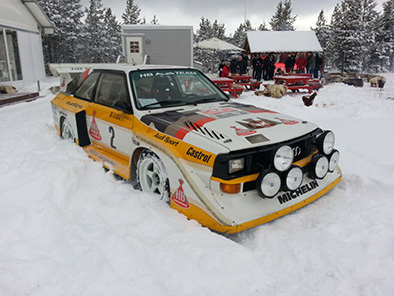 The big question is would you have one over other sports saloons? The owners of the Château opted out of a new 7 Series order for their Model S and haven’t looked back. On a personal note I believe it’s a technological masterpiece. 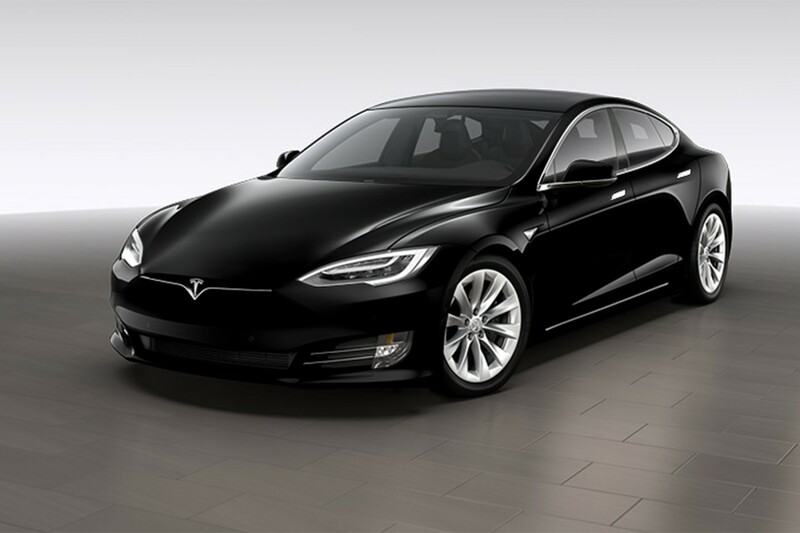 The Model S has come a long way since production started and it will only get better. I have heard gripes about build quality and yes the wipers do squeak a little, the seat belt holders are not adjustable, the semi-autonomous drive function isn’t fool proof and there are no blind spot indicators on the mirrors, but all is forgiven when you drive it. It’s a phenomenal piece of kit to spend time in and I for one would purchase a Tesla!